Another way to think about line drawing is to look for shapes within your subject. Take the old dock in Coupeville: It’s a pentagon (the primary building) on top of a large rectangle (the dock and pilings). In front are some very long, narrow rectangles (the foreground pilings). 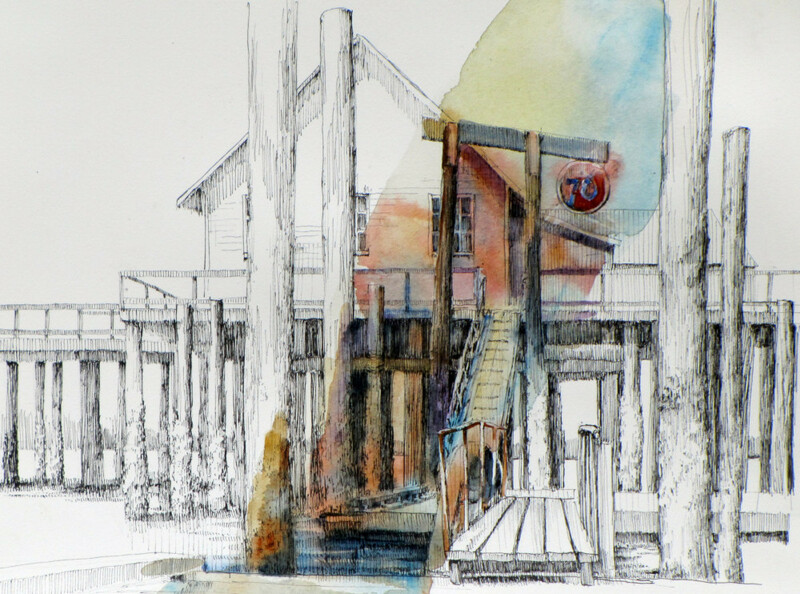 Often times when we look at a scene, we’re overwhelmed by all the the details – the barnacles on the pilings, the number of pilings, the grain of the wood, the ever-changing light on the water. But, you can train your eyes to see the big shapes first. Once you see those big shapes, then start noticing how they interact with each other. For example, where do the rectangles of the foreground pilings intersect with the pentagonal shape of the building? Establishing these basic forms helps place the subject on your paper and provides the foundation for the details to be added later. Those in the Northwest might recognize this subject as the public dock in the charming town of Coupeville on Whidbey Island. This is the way it looked many years ago when I first saw it. Then, it was a gas dock and, yes, there really was a round “76” sign hanging above the ramp. Since that time, the entire structure has been updated and the building is now a museum and a guest dock for visiting boat. I’m so glad I kept photographs from my early painting and drawing expeditions. It’s great to document those things that no longer exist.